Making the smallest adjustments to a home can reap some serious benefits. For example, home owners should consider insulating their attics. Hiring a roofing contractor to investigate this space makes a home more comfortable, increases the value of the property and is sure to save people money. One of the chief benefits of investing in attic insulation is that people can cut back on their energy costs. Heating and cooling systems will not have to work as hard to regulate a home's temperature. A lot of energy can be lost if an attic has gaps in its insulation or no insulation at all. Cutting back on energy use means that utility bills will quickly fall too. Thus, one can be environmentally friendly and also save money in the long run. Insulating a property's attic is a chance to increase the value of a home. Buyers love when attics are finished or have insulation. This is an alluring feature for consumers looking for energy efficient homes. A little investment today will have some serious benefits if a property owner ever decides to sell. If an attic lacks adequate insulation, then the home's temperature is sure to swing between hot and cold. No one wants to feel uncomfortable in their own home. If there is a gap in insulation, then the temperature will change drastically. This means that people are never completely comfortable in their home. Talking to a roofing contractor and adding insulation ensures that a home's temperature is truly balanced. The US Department of Energy offers a lot of tax benefits to people. The New Energy Bill says that home owners can receive up to a 30% tax credit if they add insulation to their home. This could mean hundreds of dollars in credits. Home owners need to visit the US Department of Energy for more information about documentation, the benefit and requirements for the insulation. An attic can be used for more than storage. By insulating the space, homeowners can convert a room into a bedroom, office and more. This is a chance to make use of all of a property's space. Some homeowners even use the attic as a playroom or home gym. Many homes today do not have proper insulation, especially older properties. Investing in attic insulation is a chance to increase the value of a home and make use of this space. The US government has tax benefits for homeowners who make their properties energy efficient. By investing a little time and money today, a homeowner can save on their taxes and greatly lower their utility bills. This is a win-win situation that doesn't take much time or hassle. A quick call today means a contractor can come out, inspect the same and offer an estimate then and there. This process takes little time and has too many benefits to ignore. One of the most important features on any home is the roof. Because it's so significant, it's essential that it is well-maintained and properly repaired, when necessary. The best way for anyone to ensure that this part of their home is up to par is to solicit the help of a professional roofer. Now, there are some who believe they don't really need a specialist to get the job done. In their eyes, they can save some of their money by getting amateurs to do the work. In actuality, this really isn't the best decision. First of all, someone who isn't a professional roofer would more than likely make some major mistakes. This isn't just because of the fact that they haven't had proper skill training, but it's also because they probably won't have adequate experience. Sometimes, it doesn't just take education, but it also takes experience. Having a roof that isn't fixed correctly could cause several annoying inconveniences. For example, some leaks could form. Some may not think this is a big deal as long the water doesn't come directly from their ceiling into their homes. However, this is a very significant issue for people with attics that they actually use. There are some people who have even made bedrooms in that area of their home. So, if there were a leak, it could cause a major problem. Even for those who don't use their attics, providing proper care to their roof should still be very important to them. That's because the effects of the leak can still enter the main part of the home and cause things such as mold to grow, which is another major issue in and of itself. Besides the fact that they can get the job done correctly and prevent further damage, it's important for homeowners to hire a professional, because an amateur could end up seriously injuring themselves. This is especially true of someone who hasn't been through any formal training. Besides learning how to actually fix and repair a roof correctly, during these sessions they also learn safety rules. Someone who hasn't gone through this type of training would more than likely miss out on those essential lessons. What makes safety so important in this case is the fact that certain mishaps, such as falling off of a tall building, could potentially lead to death. It may seem like a good and economical idea to seek the assistance of an amateur for roofing problems. However, this isn't necessarily true. Overlooking the importance of a professional roofer can cause many problems including serious injuries as well as even more roofing issues. While most people may view gutters as an unnecessary aspect of a home, the truth is that they are important. Whether you are dealing with seamless gutters or just the normal kind, this component of the home is one that you must consider as a homeowner. This is because gutters protect homes in many ways and failing to install them may lead to complications later on. One of the ways through which gutters protect your home is by helping to keep you dry. Should it happen to rain, even if it is a light shower involved, the water will move from the roof tops straight downwards. If you happen to be entering or leaving your home at this point, then chances of you getting wet are very high. With gutters however, the water from the roof is contained and directed to designated places, thus helping to keep you dry. Another importance of gutters as far as your home is concerned is the fact that it helps keep your home as dry as possible. Over the course of time, rain water that pours from the roof to your basement, walls, windows or doors will carry with it heavy side effects. These effects include flooding of the basement, water seeping into your foundations, and so on. Gutters are therefore instrumental in protecting your home by preventing your foundation from becoming unstable. They also ensure that you do not have to deal with the flooding more that you should since the gutters end up funneling the rainwater away from the basement. This ensures that it remains dry and anything stored in there remains safe. In addition to protecting the basement and the foundation, gutters also come in handy in ensuring that water does not leak into the walls. This in turn prevents walls from cracking. Due to this protective measure, you will be able to save money you would otherwise have used filling up the cracks whenever the rainy season is over. This money can be used to make other useful investments for the future. Because gutters funnel water away from doors as well as other structures made from wood, it will be possible for you to avoid dealing with complications arising from wood rot. Homes with gutters have fewer incidences of rotting and warping wood as well as damage to the paint on exterior wooden surfaces. During the rainy season, the amount of water falling from the roof to the ground can be very strong at times. Seamless gutters as well as the normal kind of gutters come in handy in ensuring that your lawn does not get the worst of this strong force of water. By funneling the water to designated storage areas or drainage points, gutters help in the prevention of soil erosion as well as in the protection of plants and flowers that are growing in the exposed areas. Gutters are also a great way of keeping your home cleaner. This is because they keep the water from the rain, from splashing too closely to the lower parts of your exterior walls. As far as money is concerned, they do provide great value and will keep your home maintenance costs low. When it comes to building and maintaining homes, the roof is one part of the house that needs timely maintenance and care. We all know that if there is one part that gets directly hit by rain, hail, sleet, or snow on a constant basis that is the roof. It can get worn out easily and could result to water seeping into the house during heavy rains. We don't what that now, do we? Most people fail to realize the importance of roofing contractors and commercial roofing companies. Fixing your own roof can be the quickest fix to a hole on the roof but this isn't the best long term solution. Aside from getting the best results when it comes to replacement, maintenance, and repair you also get better customer satisfaction by trusting all your needs to commercial roofing contractors. The single most common reason why we get help from roofing contractors is for roof construction. Contractors provide the most advanced tools and equipment when it comes to roof construction. A roof is not merely something placed on top of a house to shield it from the heat of the sun or keep everyone dry inside. Creating a roof involves choosing the perfect design to complement your home and choosing the highest quality materials to make sure that you end up with a stronger, more durable roof that will last ages. Getting experts for the job gives you more desirable results. A secure and stable roof associates to a safe and secure home for you and your family. Constant rains, storms, and wind damage can weaken the structure of your roof and can result to fissures and cracks that can lead to leakage, and can be extremely bothersome. Leakage does not only mean roof damage but it can also damage the furniture and appliance inside your home which are supposed to be dry. Only commercial roof repair professionals provide the quickest and the most efficient schemes when it comes to rooftop revamping. When it comes to roof damage, homeowners are given two options. That is to go for rooftop repair and or have it replaced altogether. To avoid replacing or repairing your roof, professional commercial roofing companies provide regular maintenance services to ensure that your roof is always in good condition. Getting quality contractors ensures that you will never have to repair or replace your roof. But for some who neglect regular roof maintenance, roofing companies provide roof repair or replacement to avoid any type of mold or bacteria growth caused by constant leakage and moisture that could also result to different health issues. By contacting professionals you get the best customer service and best value for your money. Obviously a minor repair is going to cost considerably less than a replacement. In fact, the size of repair and the size of your roof are among the biggest factors that influence your repair estimate. Roofing contractors will generally quote repairs and replacement based on square footage, so a smaller roof's repairs will cost less than a larger roof's repairs. As you can easily see, there are many factors that will influence the cost of roofing repair or replacement. That being said, estimates will not only vary depending on the features of your roof; in fact, estimates will vary depending on the roofer as well. As such, it is best to consult with a number of roofing professionals to get a number of estimates so you can choose the best roofer at the best price. If your building has an old roof, it may be showing signs that it needs replacement. Different roofs have different lifespans, but they often show the same signs when they need replacement. Below are six signs your building may need reroofing sooner than later. Roofs develop occasional leaks that can be patched. But when multiple leaks occur, it could be a sign that your roof's moisture barrier has declined significantly. If your business uses buckets to catch interior drips when it rains, it may be saving its carpet, but it isn't preventing trapped moisture that encourages mold development and weakens roof decking. Ultimately, replacing a leaky roof can be less costly than repairing the damage it could cause. If you can see sunshine through your business' roof, hopefully you can see the light: you need to replace your roof, or at least have it professionally repaired. Exterior light can be seen when roofing separates from chimneys, exhaust pipes, or other elements that extend through the roof. Performing amateur repairs on these problems can lead to flooding during heavy rain. Brown spots on hanging ceiling panels indicate one of two problems: leaking pipes or a leaking roof. When present on tiles that don't underlie a roof, the problem is usually the former. When present on tiles that do underlie a roof, the latter may be to blame. If your business frequently replaces or paints ceiling tiles that underlie a roof, calling a roofing company to inspect for leaks will save money in the long run. Sagging roof decking makes sections of roof appear bowed inward. Sagging decking is most visible from the exterior. But in severe cases, it can be detected by observing a ceiling. Sagging roof decking is a tragedy waiting to happen. Often, a section of sagging decking completely gives way during heavy rain or snow, causing severe damage that costs more than a new roof. Buildings whose shingles need replacing display a telling sign: their gutters become filled with shingle granules. If your building has a shingle roof, is not surrounded by trees, and has clogged gutters, the problem could be deteriorating shingles (a quick look at your gutters should let you know). By not replacing old shingles, you'll end up with a leaking roof and spend money on gutter work that could instead be used for commercial reroofing. 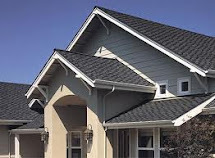 Movement of roof decking causes shingle buckling, water absorption causes shingle curling, and blistering occurs when shingles receive inadequate ventilation. When a patch of shingles buckle, blister or curl, the problem can be repaired. But when buckling, blistering or curling affect most or all of a roof, reroofing may be necessary. Replacing your building's roof is a major decision. But when your building displays some or all of the signs above, replacing it as soon as possible could be the least expensive decision.